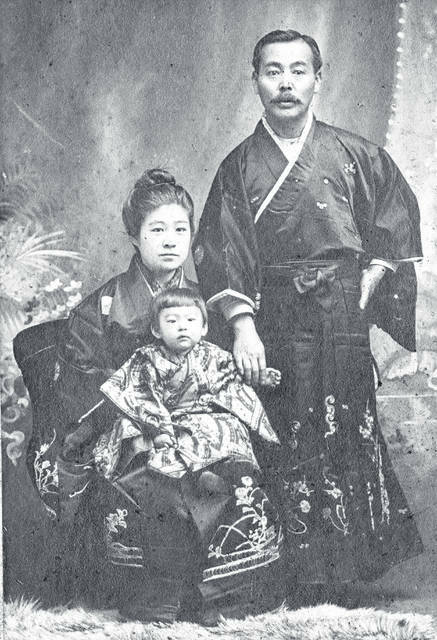 This photo, one of dozens of undated, unidentified pictures kept by the Highland County Historical Society, appears to depict a family wearing traditional Asian garb posing for a snapshot. To the best of our understanding, an inscription on the back reads “Paul + Koh to Ashida.” A faded stamp on the back shows the address 1128 Pacific Ave., Tacoma, Wash. Do you know who they are? Where the photo might have been taken? When it might have been taken? We’re interested. Call us at 937-393-3456, email us at HTGinfo@timesgazette.com or visit us on Facebook at www.facebook.com/TheTimesGazette.